A screen capture of the new Coastal Storm Preparedness Story Map online at s.uconn.edu/coastalstormpreparedness. As part of NOAA’s Coastal Storm Awareness Program, ten social science research and related technology transfer projects were funded to improve public response to coastal storm hazard information. In one of these studies, Marlon et al. (2015) found that the majority of coastal Connecticut residents (70%) are either unsure or unaware if their home is in an evacuation zone as determined by flood maps developed by the U.S. Army Corps of Engineers, and 74% of coastal Connecticut residents have never seen an evacuation map for their local community. 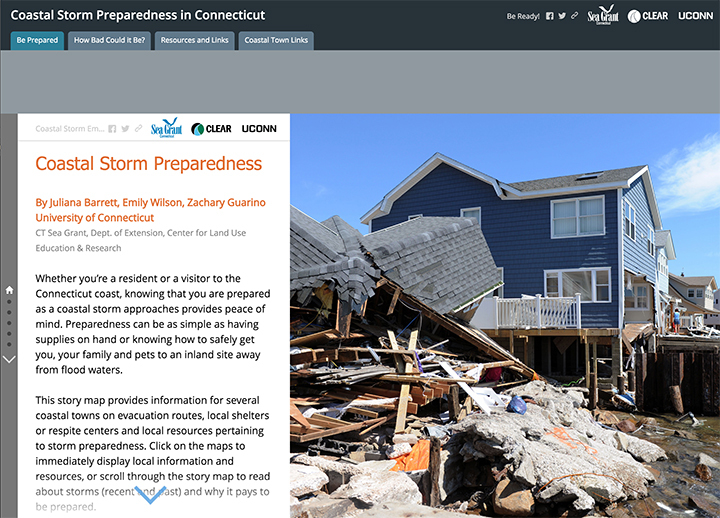 In order to provide information on evacuation zones, local evacuation routes and customized municipal preparedness, Connecticut Sea Grant and UConn CLEAR developed a Coastal Storm Story Map. A story map is a tool developed by the software company, Esri, that allows one to combine interactive online maps with text, images and videos to tell a story. This story map provides information on evacuation zones and local evacuation routes, as well as links to sign up for town emergency alerts. Piloted with four coastal towns, our goal is to have information for all coastal and riverine communities throughout the state. If any town is interested in providing evacuation route and shelter information for the story map, please contact Juliana Barrett at juliana.barrett@uconn.edu. As a reminder that major hurricanes can hit the Connecticut coast, the story map includes historic aerial photographs and stories from the Hurricane of 1938 which caused massive devastation throughout much of Long Island, NY and New England. This information provides graphic illustration of the powerful flooding and destruction that can accompany such a storm. Also provided are numerous links and resources for storm preparedness from household paperwork to pet safety. Climate Corps students role playing in a mock town hearing. Here, a town resident (upper right) is testifying before the Town Council (left), as local reporters take notes (foreground). With the start of the fall semester, the UConn Climate Corps began its second year of operation with 24 students enrolled. The Climate Corps is a unique blend of classroom education, service learning, and Extension outreach supported by the Provost’s Office. 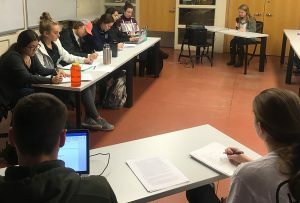 Students take a fall semester class that emphasizes town-level impacts, issues and responses related to climate change. They can then choose to go on to the spring semester, where student teams work with town officials on various projects related to climate resiliency. The goal is to give the students some practical real-world experience as they get ready to enter the work force, while at the same time providing meaningful assistance to towns attempting to plan for climate change with meager resources. Last spring the Corps students worked with three communities and a multi-town land trust on five projects, ranging from “downspout disconnection” stormwater programs to town applications to FEMA’s Community Rating System (a program where towns that document sufficient resiliency practices can quality for reduced flood insurance rates for residents). The Climate Corps model has also engendered a second program, the Brownfields Corps, part of the Connecticut Brownfields Initiative led by the School of Engineering. The many partners involved in these efforts hope to bring on the Stormwater Corps as a third offering, and coordinate and administer them as one program under the name Environment Corps. Building on the foundations from two previous Legal Issues in the Age of Climate Adaptation workshops and the participants’ questions they generated, this session will focus on the legal and physical challenges municipalities are facing due to road flooding from extreme high tides and sea level rise. LOCATION: Middlesex County Extension Center, 1066 Saybrook Rd., Haddam, CT.
8:30 Registration – Program runs from 9:00 to 2:30. Read detailed Agenda. 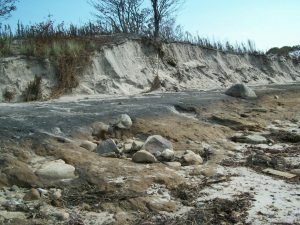 GROTON, CT—Connecticut Sea Grant announces a new website intended to assist coastal Connecticut beach property owners and beach associations with hazards such as impacts from storms and associated erosion and flooding. The new site helps users evaluate threats and prepare to protect property from further damage. A variety of actions, depending on the scale of damage and cost, are provided, including options such as dune restoration, repairing seawalls, moving landward or elevating structures. Visit the website at beachduneguide.uconn.edu. “We hope this website will be a valuable resource for both coastal property owners and managers in helping to protect infrastructure as well as the natural environment” said Dr. Juliana Barrett, one of the site’s creators. Barrett is an associate coastal habitat educator with Connecticut Sea Grant and UConn Extension. 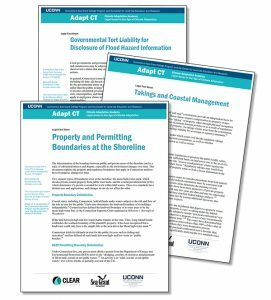 The site was based on Maine Sea Grant’s Coastal Hazards site; we have added our own special touches in adapting to Connecticut. Climate change is here now, and we need to prepare for more extreme weather events and build more resilient communities and ecosystems. Check out these easy-to-use tools, including interactive maps and visualizations, that will help prepare your community for the impacts of climate change. See how you can help your community or business get ready.